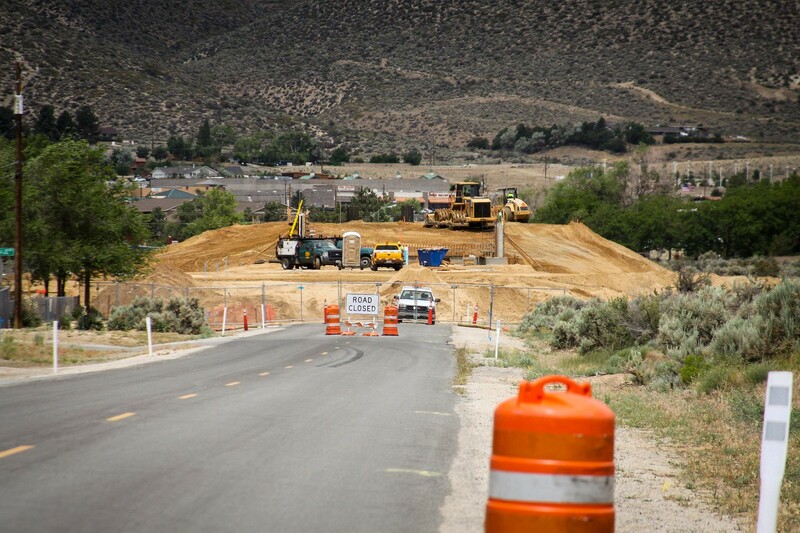 Construction on the Carson City Freeway at the south end of town has been proceeding furiously. The earth movers have been hard at work moving the earth. 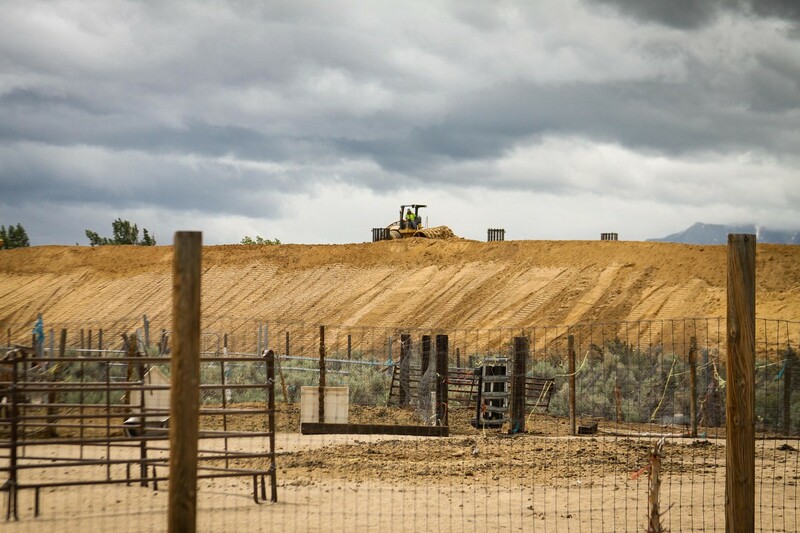 This pit here right by the highway has been dug bigger and deeper every day, as they pull dirt out of it to use to build up the roadbed in other places. One place that they’re using all this dirt is here at the bridge. 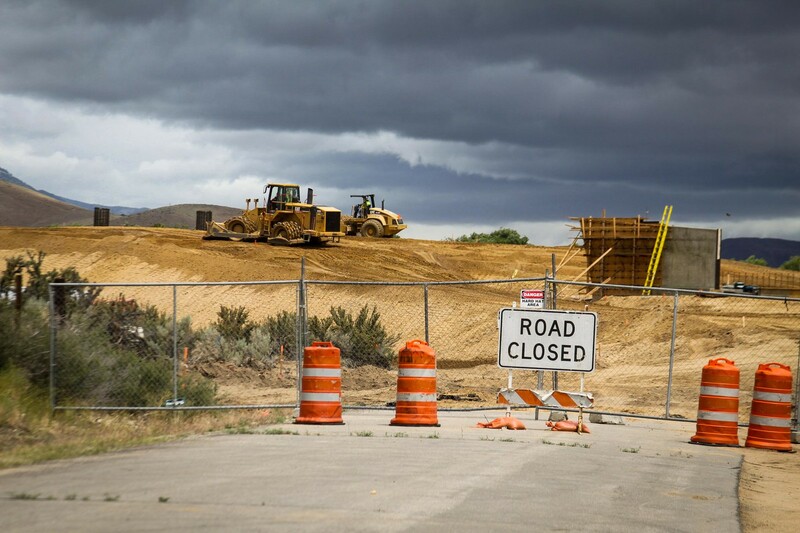 NDOT figured out a few years ago that the way to build a bridge is not to build all kinds of scaffolding and falsework to hold the bridge up while it’s being built. Instead they just pile up dirt to the height of the bridge deck, then build the bridge right on the ground. It means a lot more tractors moving dirt around, but overall it’s probably a lot simpler to do it this way. The bridge support columns are fully built here, but they’ve been buried. Now only the very tops are sticking out. After the bridge is finished, they’ll pull all the dirt out and we’ll be looking at a complete bridge, up in the air where it belongs. Looking down Synder, the elevation of the bridge becomes obvious. We’ve got to get up and over the freeway at this point, so the bridge has to be pretty high up. 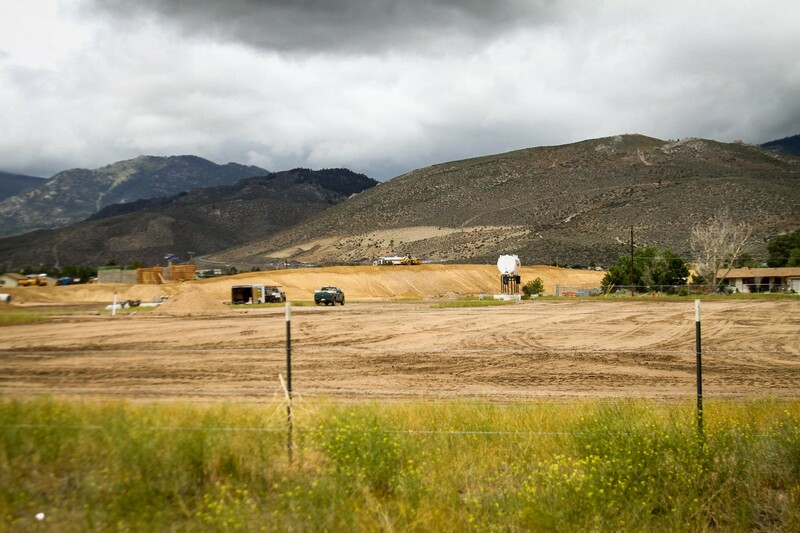 A long view shows the curve of the dirt hill, which will be echoed in the curve of the finished bridge. Even though this hill is only temporary, is still has to be well-built to support the weight of the bridge without settling. That means it has to be properly compacted and be a solid piece of engineering in itself. Looking back, east on Snyder. Next to the water truck you can see the rebar for the bridge abutment. Most of the elevation gain will be achieved on the approaches to the bridge from each side. The actual bridge itself will be an arch, but the middle won’t be much higher than the edges. All the dirt for the approaches will stay there after construction is finished and the roadbed will be built on top of it. Only the dirt under the bridge itself will be removed. 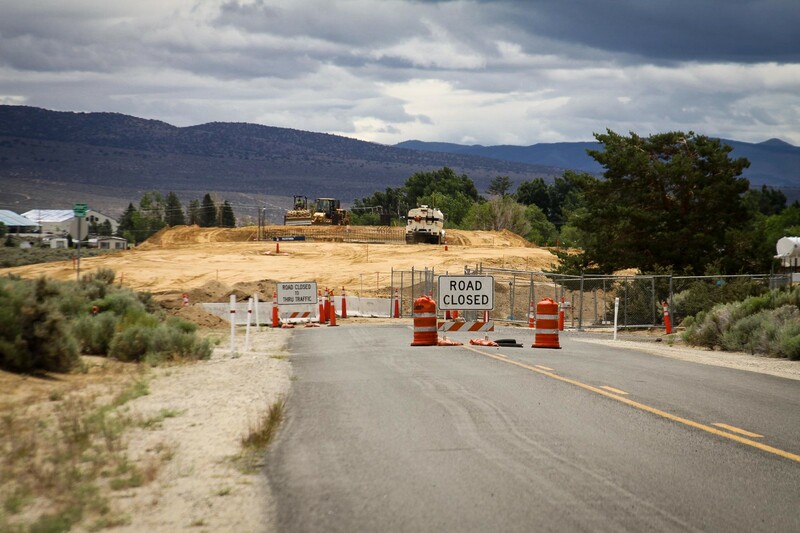 There’s a lot of work left to do, but the south end of Carson City has already been transformed in the few short months they’ve been working on this project. There’s a lot of good momentum, and besides the bridge itself they’re also working on grading the roadbed to the east and west of Snyder. 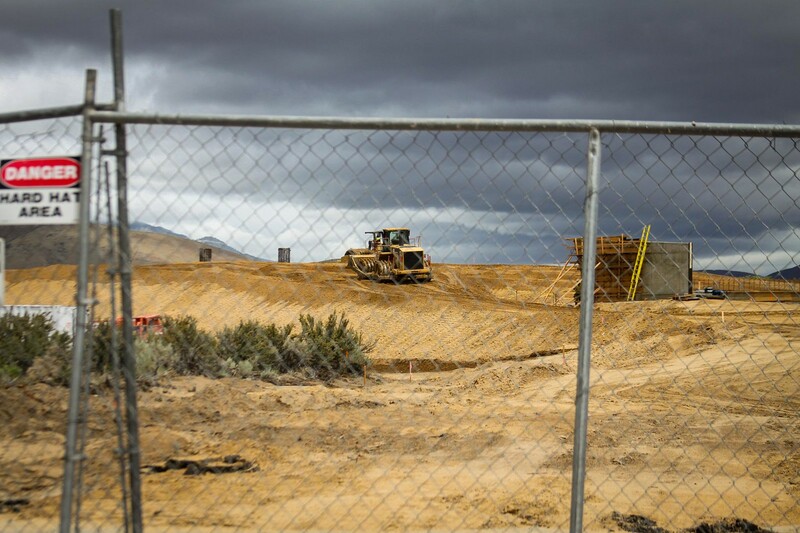 Including a lot of earthmoving for the approach up to the Hwy 395 overpass. I hope that once the bridge is finished they don’t just stop and let the site sit dormant for a couple of years, but there’s a pessimistic voice in my head saying that’s exactly what will happen.